It's that crazy time of year again.....Fashion Week! About two weeks ago I attended NYFW on one of the rainiest days ever. It literally did not stop raining the entire day, not even for an hour or two. I went to a show in the East Village and spent the rest of the afternoon in Tribeca with Derek. We mostly hid in shops and cafes due to the weather but it was still such a perfect day. I'm always looking for a reason to go to New York and Fashion Week is is always the best excuse of all! I picked out this jumpsuit because it's both comfortable and chic - my favorite combo! The color is perfect for any time of year and it was easy to pair fun accessories with. I'm loving the statement earring trend so I went with a pair of oversized, circular black/cream tortoise earrings. I want to wear them with everything! I went with a pair of mules to also stay on trend (and secretly comfortable) and also through on a leather jacket because of the chill. You can check out what my day in New York looked like on Instagram via My Highlights! I hope you all are having a great week! Mine seems to be flying by. Yesterday I attended a Ladies Get Paid (an organization that focuses on the career development of women) Town Hall on the topic of "A Woman Among Man-y", so essentially on being a woman in male dominated industries (aka pretty much every industry) and Thursday night I'll be attending a "Sip n Shop" event at one of my favorite boutiques in the city. I always try to go to an event or two during the work week to help break up the days before the weekend. Do you have anything fun planned this week? Or do you prefer to keep work nights chill? You looked amazing! Love the outfit choice. Prefect outfit for fashion week. My week has been a busy on. Filled with dr. appts. Great outfit choice - love your shoes!! I don't understand much from fashion. but this is pleasing to the eye. 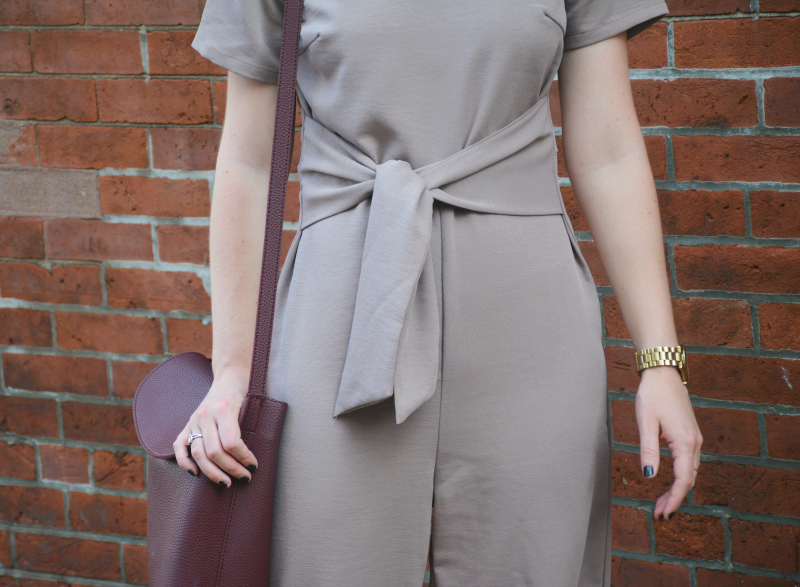 Such a flattering jumpsuit! Love the waist detail!